I’m a pacifist, but I’ve never been intellectually impressed with the U.S. peace movement. The sound argument against war, in my view, combines (a) the common-sense moral view that, “You shouldn’t kill innocent people unless you know with high certainty that the long-run benefits heavily outweigh the short-run costs” with (b) the empirical fact that predictions about war’s long-run benefits are extremely inaccurate. U.S. peace activists’ typical arguments against war are both too weak and too strong: Too weak because they focus on the badness of particular leaders and regimes rather than the murderous essence of modern war, too strong because they make overconfident, overblown predictions about the long-run effects of wars they oppose. Worse still, U.S. peace activists have a ghastly tendency to side with despicable totalitarians and bloodthirsty nationalists. 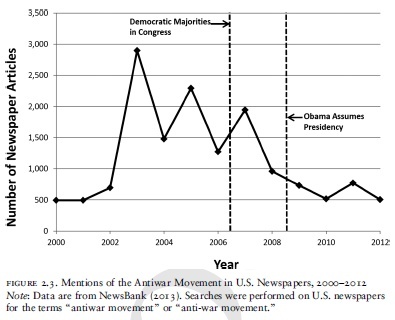 Kind of ignoring the reality that the Iraq war was what most of those protests and articles were. While I tend to think the antiwar argument above tends to hold alot of water, the reality is that the arguments against the Iraq war seemed clearer and hundreds of Americans dying did not seem worth it to the average person. Much like there are legitimate budget hawks in the Republican party who get ignored when republicans are in charge, there are lots of legitimate doves in the Democratic party. When the deficit doubles under a democrat in a few years the Republican budget hawks get alot of traction because even the average voter can tell there is probably something wrong. If the deficit growth GREATLY slows under republican president those deficit hawks would gain less traction. In short I think your characterization of Democrats as unprincipled political war profiteers is harsh and callous. It’s important I think to give your opponents some credit as intelligent principled people, even if they are wrong. Caplan can be rather harsh and no-nonsense in his approach, but at least he is data-driven. It seems to me that your objection rests largely on the assumption that “arguments against the Iraq war seemed clearer.” Clearer than what exactly isn’t explained, though I assume you mean clearer than other military entanglements. I doubt that is really the case. Most of the “clear-eyed” view is hindsight. Plus, the “blood for oil” narrative adopted by so many protesters (as demonstrated by their signs) isn’t really accurate, so their reasons for objecting weren’t correct, even if in principle they may have been right. But even still, your objection suggests that the protesters weren’t really pacifist or anti-war, but merely anti-Iraq War. While that may be fine in itself, it still means they weren’t truly anti-war in general. This fits snuggly with Caplan’s explanation. Your claim that this post paints Democrats as “unprincipled political war profiteers” is a bit of hyperbole on your part, though Caplan would likely describe all politicians as just that. 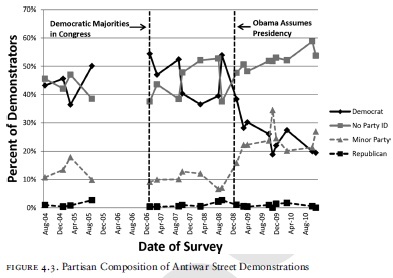 Here, however, he simply points out that when it comes to Democrat vs. Republican war policies, they tend to be very similar (Caplan provides other links on this). And even though Democrat politicians later blamed the Bush White House for the Iraq invasion, many leading Democrats voted in favor of it, including Clinton, Reid, Kerry, and Biden (though you wouldn’t think this given their later rhetoric). The majority of Democratic senators and a large chunk (though not a majority) of House Democrats voted in favor of it. Nonetheless, the post is largely about *protesters*. He mentions the “honorable outliers” among them, but the numbers are very clear: a gigantic portion of protesters who were Democrats stopped protesting after Democrats regained power and especially after Obama became president. I don’t think this has anything to do with them being unintelligent or even unprincipled. 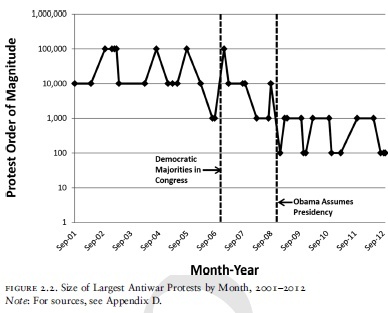 I think it has everything to do with partisan politics and cognitive bias. It’s human nature.